Dan Biggar admits it was 'a bit strange' to face his former club in his first game for Saints. But the Wales star enjoyed the experience of taking on the Ospreys as his new side won 26-13 at Brewery Field. Biggar, who had spent his entire career at Ospreys prior to his move to Northampton, came off the bench at half-time to steer Saints over the line in Wales. And he said: "It is a bit strange, first game up. It would have been even stranger had it been at the Liberty Stadium - I definitely wouldn't have known what changing room to go into! "But it was good to get a bit of a run-out, conditions were pretty difficult and we probably just about did the basics better. "Our forward pack edged it in both halves for us in terms of field position. "It was a good first hit-out for us and we'll probably just be looking for a bit more sun on Friday night to test our systems but we did the basics pretty well." 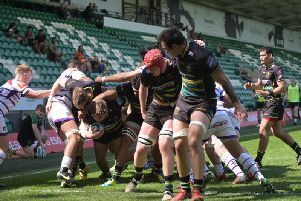 Tries from Ollie Sleightholme, David Ribbans, James Fish and Api Ratuniyarawa got the job done for Saints in their first fixture under new boss Chris Boyd. And they will now switch their focus to Friday's game against the Dragons at Rodney Parade. "One thing we said before we went out on Saturday was to make sure we have confidence in our own ability," Biggar said. "It's always difficult to judge where you're at in pre-season but we showed plenty of quality throughout the 80 minutes. "We had to roll our sleeves up and there were some times in the first half where we played some good rugby as well. "All in all, it's exciting. "We knew we were playing against a pretty young team in the Ospreys, but it's a great start for us. "It's something for us to knuckle down with this week and get ready for the Dragons on Friday night."